The word “Dolby” is intrinsically linked with the concept of high-fidelity sound. If you’re old enough, you will remember when Dolby was synonymous with an awesome button on your car or home stereo that reduced the noisy hiss present on all audio cassettes. Today, while Dolby still does a lot of work in the area of noise reduction, consumer attention long ago shifted to Dolby Digital and Dolby Surround. And now, it’s time to shift your focus once again to one of the most exciting audio technologies I’ve seen (heard) in recent years: Dolby Atmos. The recording and playback of audio, as you’re probably aware, is a relatively simple affair compared to, say, rendering the graphics of a complex video game at 60 frames per second. Basically, it’s all about recording a waveform, storing that waveform, and then playing it back at high fidelity. Even when you have eight different channels (Dolby Surround 7.1), you’re still just doing the same thing: Recording eight different audio streams, storing them, and then playing them back. The problem with such a simple, low-tech setup is that you’re often forced to make all sorts of compromises. If you have a perfect Dolby Surround 7.1 setup, with the speakers placed perfectly, and everything wired up correctly, then you’re fine. If the speakers aren’t placed correctly (in most cases they aren’t), or you only have a 2.1 or 5.1 setup, then the end result can be thoroughly sub-par. There are technologies that can replicate positional sound using smaller speaker setups (2.1 or headphones), usually referred to as virtual surround, but again there are compromises and limitations especially if the source audio isn’t in exactly the right format. Enter Dolby Atmos, which does away with the age-old concept of channels entirely. Instead of channels, Atmos introduces the idea of object-based sound design. Instead of having fixed waveforms that are recorded and set in stone by the TV/movie/game audio engineer, the process of audio production instead becomes a 3D map of sound objects moving through space. So, for example, instead of the audio engineer hand-crafting a 7.1 audio feed of a bullet flying over your head, he would instead create a 3D model of the scene (with guns and bullets and actors and scenery), attach some sound properties to each of those objects, and then trace the path that the bullet takes. Do this for the entire TV show/movie/video game, and you end up with a digital file that contains every last ounce of the production’s audio data. Think of as the audio equivalent of a digital photography Raw file. From this complete 3D audio map, magic can then be conjured. 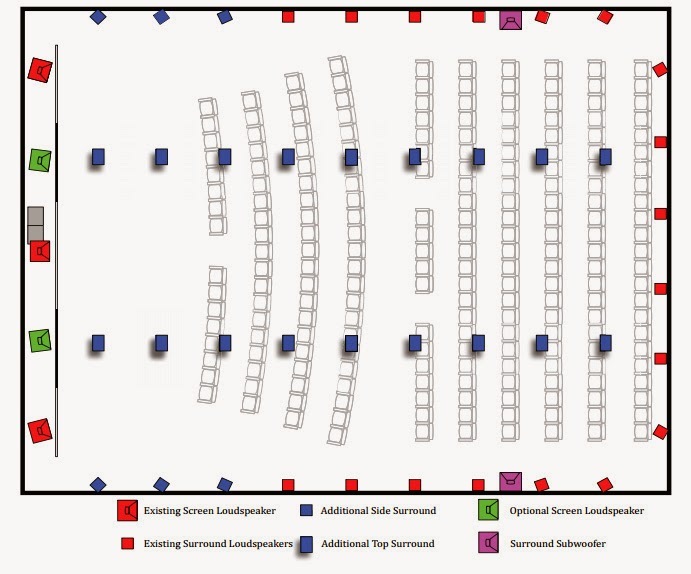 The first-generation Dolby Atmos Cinema Processor (a big box that’s only installed in a few hundred cinema screens worldwide) takes this audio file, and produces up to 64 unique speaker feeds. Because of the 3D nature of the Atmos audio map, these speakers can be located anywhere even above you, creating what’s known as height channels. When I asked a Dolby representative about the possibility of speakers below me, I got a knowing smile in return. 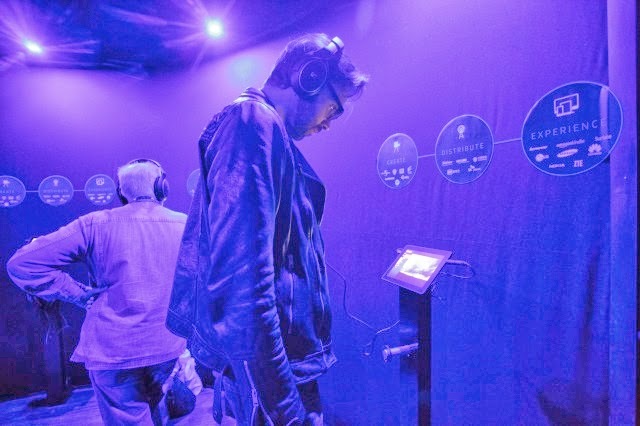 At Mobile World Congress in February, I had the chance to try out a Dolby Atmos cinema setup and the impact of the multi-speaker surround sound technology, plus the additional height channels, is quite frankly awesome. The sound of rain, quite literally falling from above you, is amazing. The deep, chopping thunder of a helicopter flying behind and then over you, is terrifying. I left the Dolby booth with an incredibly strong hankering for my own Dolby Atmos setup here at home but sadly, for now, it’s only available for large-scale digital cinemas. The main problem with Dolby Atmos and its mobile sibling, of course, is that it requires an entirely new approach to audio engineering. TV, movie, and game studios have been producing 2.1, 5.1, and 7.1 audio feeds for decades. Switching to Atmos requires new software, new hardware, and a different set of skills. The first film that utilized the Dolby Atmos format was Pixar’s Brave in June 2012, and there have only been a few dozen Atmos releases since. The other problem is that the Atmos “audio map” is currently only distributed as part of the heavily encrypted and very strongly restricted Digital Cinema Package (DCP) format. Still, the outlook for Dolby Atmos is fairly strong: Many of the major film studios now seem to be on board, lots of 2013′s blockbusters used Atmos, and 2014′s showing looks like it’ll be fairly strong as well. It’s now a matter of growing the number of Atmos-equipped cinemas, and eventually if a suitably secure format can be devised getting the home cinema and gaming markets hooked as well. Historically, I would’ve said that we’d have to wait for the next optical disc standard, or even the next one after that but with the growing popularity of digital distribution of games and movies, Atmos could find its way into our homes sooner than expected. This is a great web site for tunes hearing it is now most widely used and simple web site tunes available in this website are top quality. I really mean that anyone who wants to save your time as well as anticipate top quality tunes them only visit the Toblay best indian songs it's very have confidence in full and optimistic. There are every kinds of tunes available aged in order to new ….